Today, for the 40th instalment in the series, I have another fantastic international author for you; RJ Ellory, who earlier this year won the Theakston's Old Peculier Crime Writing Award. Ellory visited New Zealand last month in support of his latest novel THE SAINTS OF NEW YORK, and I got the chance to sit down and have a chat with him over a drink in Auckland. He's a very interesting, intelligent, and down-to-earth guy, as well as being a terrific writer. We did get a photo, although it looks a bit strange as the flash on my camera died just as the photo was being taken, giving an unusual effect (see below). As some of you may be aware, RJ Ellory has an unusual background; he was orphaned as a young boy, later spent time in jail for poaching, became a rock guitarist, wrote 22 unpublished novels in longhand before he was first published, and now has published several acclaimed novels set in the United State, although he is a British author. You can read more about RJ Ellory and his books here. Sherlock Holmes; it was just the first real crime fiction I read, and there was something fascinating about a morphine-addicted, cocaine addict genius. And it was the darkness, the dark underbelly that is not really conveyed in a lot of television adaptations and films, the tortured genius aspect of this crazy guy. As a young guy, 11, 12, 13, 14 years old, all these short stories and four novels, just tremendous. And I re-read them periodically. The book that I read that really made me understand the power of fiction - I was orphaned at seven and ended up at different schools and homes and so forth, and I remember being 12 and getting chicken pox. And in a residential facility if someone gets chicken pox you quarantine them, and I was quarantined in a sanatorium, essentially locked in a 12-bed dormitory, and out of the porthole window of the dormitory door was a black and white chequerboard corridor with doors off it into different sections and different rooms, and I was at the far end of the room. And every so often they’d put food through the door, and I’d run to the door and look down the corridor, and never see anybody. By the time I got to the window whoever was there was gone, so I was constantly hearing footsteps but not the seeing the people. And while I was in there, I read THE SHINING - half of it I didn’t understand, and half of it scared the living crap out of me. I used to wake up in the middle of the night in the middle of a nightmare, but at the same time compelled to keep on reading it. That book really got under my skin and really made me understand the power of fiction. Well you already know the story; 22 manuscripts that were unpublished and will continue to remain unpublished. Some detective stuff, some legal thrillers, some horror stories, it was just my learning curve. Outside of writing, and touring and promotional commitments, what do you really like to do, leisure and activity-wise?I have a blues band. I sing and play guitar in a blues band. I played the guitar for a couple of years when I was a teenager, and then a year or so ago my son said he wanted to learn so I said I’d teach him, and I hadn’t played the guitar for 20 years. His interest lasted about three weeks, and mine continued, to the point where I started practising three to four hours a day and got professional lessons, to the point now where I’m performing live with other guys. It’s just something that I’ve always wanted to do, and now I’m in the situation where I sort of have the time and the wherewithal to do it. What is one thing that visitors to your hometown should do, that isn't in the tourist brochures, or perhaps they wouldn’t initially consider?The best curry in the world. We even have a section of the city where I live [in Birmingham] where you get the finest Asian food you could ever hope to eat. Also there’s a lot of very, very good artists that perform. If you come to Birmingham, organise a weekend where you get some proper Birmingham beer, some proper Birmingham curry, and go and see a band. Philip Seymour Hoffman; I saw him do Capote, and Mission Impossible, and other films. I just think he’s a phenomenal actor and I really like him. A QUIET BELIEF IN ANGELS - nothing to do with its commercial popularity, but my books are based so much on research, and I do a tremendous amount of work to get them right. I often end up learning a great deal more about something than I can ever use it for, the CIA or the Kennedys or whatever, and often I walk away from finishing a book not only having already started another one, but also feeling that I’ve added something to myself, added something to my repertoire of knowledge. When I finished A QUIET BELIEF IN ANGELS I honestly, honestly, honestly felt like I’d left something behind. It was the emotionally demanding, emotionally draining, most emotionally involved I’ve ever got in a book. If you can imagine meeting the love of your life, and you know she’s the love of your life, no question about it, you have no hesitation, no doubt, this is the girl that you’re meant to spend the rest of time with. And she lives next door. Every day you ask her to marry you, you ask her every day for 15 years, and she ignores you every day for 15 years. And then on one day, after 15 years, she looks at you and says ‘you know what, yeah, I will’. That’s what it was like. And I went into a bookstore very near the offices where I work, and it was available, and I went to the counter and bought a copy for myself - I paid cash - and the guy behind the counter said “I’m really, really looking forward to reading that book, I’ve heard such great things about it”, and I asked him his name, he said ‘Ben’, and I opened the book and wrote ‘To Ben, with my very best wishes’, and signed it and gave it to him. And he said “are you Roger?”, and I said yeah, and then bought another one for me. So he got the first one I bought, and I got the second one. What is the strangest or most unusual experience you’ve had at a book signing, author event, or literary festival?Someone came to me with an 11-page document typed in font size 8, single spaced, explaining to me what I really meant in one chapter of one of my own books. It was wild stuff, and she took it literally sentence-by-sentence, ‘what you’re saying in this sentence is so-and-so, what I think you mean is so-and-so, what I know you mean is so-and-so’. And she just gave it to me and said ‘I want you to read this, and if you read this and know what I am saying you will become a better person’, and then she walked away. I read some of it, and it was just like ‘oh... okay...’ [chuckling]. Thank you RJ Ellory. We really appreciate you taking the time to talk with Crime Watch. 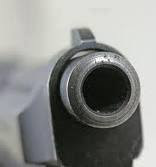 So what do you think of this 9mm interview? 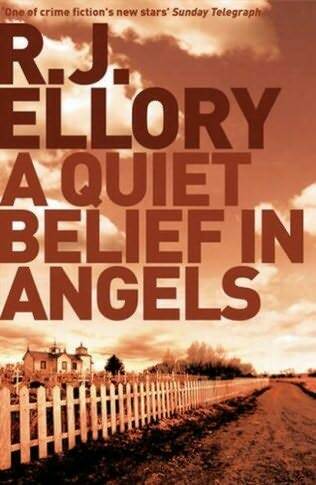 Have you read A QUIET BELIEF IN ANGELS, or any of RJ Ellory's other books? Have you met Ellory at any author events? What do you think? I'd love to read your comments. Please share your thoughts. Craig - Thanks for this great interview :-). R.J. Ellory and I have in common a fondness for Sherlock Holmes and a love of the blues. How cool that he's got a blues band :-)! I loved A Quiet Belief In Angels - it's beautifully written. Highly recommend it. Smashing interview. I finished A Quiet Belief In Angels last week and thought it was fantastic. Roger's a great guy - I enjoyed meeting him too. You didn't try to electrocute him like I did, did you?! Fortunately he was standing far enough away from my camera when the flash fizzled that he was safe Vanda. Sounds like I'm definitely going to have to get my hands on A Quiet Belief in Angels, as well as getting my copy of The Anniversary Man back from my friend I lent it too (hadn't read it myself yet).